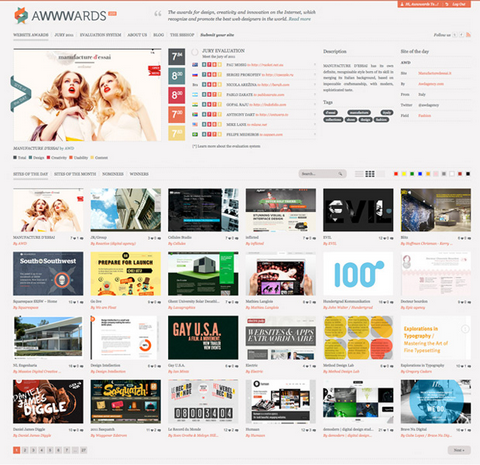 Thank you for all of the participants of Giveaway 50 x Digital Copy of the Awwwards Book. We are happy to announce the following winner. Congratulations. You will receive an email from WebAppers with the digital copy of the book. 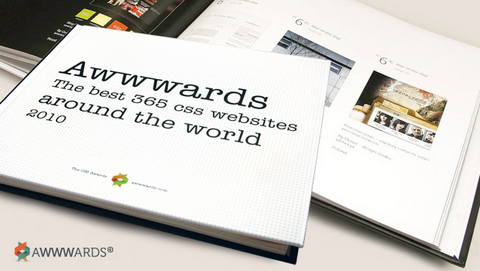 They have recently published a book: The Best 365 CSS Websites around the World. All of them are selected for the Site of the Day and Site of the Month by their international judges. You can follow facebook.com/awwwards here. Awwwards is very kind to giveaway 50 x Digital Copy of the book: The Best 365 CSS Websites around the World to our readers. All of them cost total €300 usd (£6 each). Simply leave a comment under this post. We will randomly select 50 lucky people and announce the winners on 18th June. What are you waiting for? Thank you for all of the participants of Giveaway 5 x Licenses of WordPress Developer Club. We are happy to announce the following winner. Congratulations. You will receive an email from RocketTheme about how to claim your prize. RocketTheme’s WordPress Theme Club is a new club based on the highly popular Joomla Template Club. These wordpress themes provide a stunningly unique blog design to enable you to stand out from the crowd. Their extensive community forums allow you to quickly get help and learn how to bring your own ideas to life. They offer a variety of subscription options to satisfy the needs of any individual, organization or business. RocketTheme Developer level club memberships extend the regular clubs with added benefits with the sole intention to make your life as a developer easier. 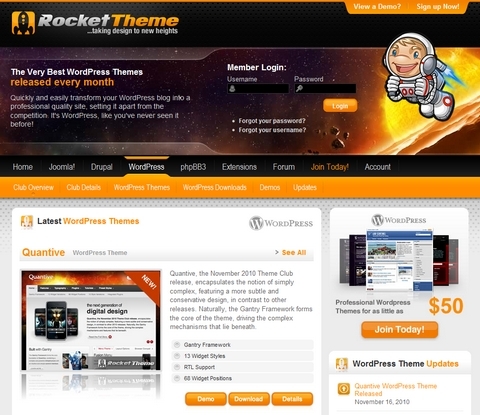 RocketTheme is very kind to giveaway 5 x Licenses of WordPress Developer Club ($250 each) to our readers. Simply leave a comment about how you would use the themes under this giveaway contest. We will pick 5 lucky person and announce the winners on 28st Nov. What are you waiting for? Thank you for all of the participants of Giveaway 5 x RapidSSL Certificates by SSLmatic. We are happy to announce the following winner. Congratulations. You will receive an email from SSLmatic about how to claim your prize. SSL is a web standard for encrypting communications between users and SSL (secure sockets layer) websites. Data is encyrpted when sent via a SSL connection to make it safer. SSLmatic offers the SSL certificates of the most popular brands like RapidSSL, Geotrust, Verisign for huge discounts. Apart from getting cheap SSL certificates, once the certificate is bought, you also become the customer of the provider which means you can get support directly from the provider itself and/or SSLmatic. SSLmatic is very kind to giveaway 5 x RapidSSL Certificates to our readers. Simply leave a comment under this giveaway contest. We will pick 5 lucky person and announce the winners on 31st Oct. What are you waiting for? Thank you for all of the participants of Giveaway 3x Bundles of $2,000 Premium Resources. We are happy to announce the following winner. Congratulations. You will receive an email from BundleHunt about how to claim your prize. Bundle Hunt 2 has just released, and will only be available for 14 days, from Oct. 4-18 and includes some of the most prestigious brands in the business. This time, they are offering more than $2,000 worth of outstanding apps, templates, icons, WordPress Themes, hosting plans and premium memberships, all for less than $50! 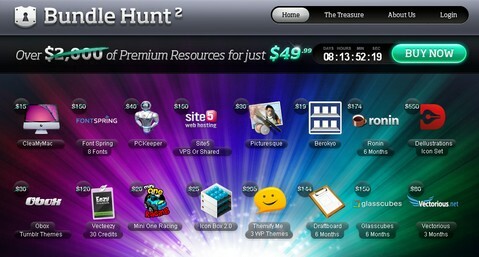 Bundle Hunt is very kind to giveaway 3 x bundles to our readers. Simply leave a comment and tell us what apps, icons, themes or memberships you would like to see in the next bundle. We will pick 3 lucky person and announce the winners on 14th Oct. Hurry up! This contest only lasts for 2 days! What are you waiting for? Thank you for all of the participants of Giveaway 3x Unbranded Version of phpLD Licenses. We are happy to announce the following winner. Congratulations. You will receive an email from phpLD about how to claim your prize.